Lagoon Explorer Junk Overnight Cruise! We're booked and confirmed for the deluxe Lagoon Explorer2 junk cruise for Jan 27-28-2007. They were booked for the 26th so we had to take the 27th. I shuffled our itinerary a little and now I feel comfortable making hotel reservations in Hanoi. It was hard not knowing what nights we'd actually be at the hotel. We leave Hanoi at about 8:45AM (I'm not sure if they'll be picking us up of if we'll have to go to their office). The drive to Halong Bay is about 3½ hrs and they stop for a potty break on the way so we'll arrive at about 12:15pm. The Lagoon Explorer 2 was the envy of many other passengers as it was more like a private chartered boat compared to the other boats which some had 16 rooms and even some at 22 rooms. Each room had an en suite bathroom with constant hot water, bath towels and good water pressure. All rooms had a large window (Room No.1 had two) and were very, very clean. 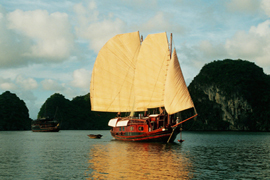 According to Thuyen (an English speaking staff), the Lagoon Explorer 2 is the newest boat on the Tropical Sails fleet. The Lagoon Explorer 1 (similar looking boat but slightly shorter in length) also has 4 cabins to the boat however it only has one communal bathroom. The Dragon Pearl (also part of the fleet) has 16 or 17 rooms, each with attached bathrooms but only serves buffet meals due to the number of passengers. On our arrival on the boat, we were served warm welcome drink (the weather was chilly). While on board the Lagoon Explorer 2, we were served like royalty with a 6 course meal for lunch, an 8 course meal for dinner (+1 fruit cocktail at the end), a set western style breakfast and another 6 course meal for lunch before our trip came to an end. They also have a well stocked bar should you want to order some wine, liquor or coffee but that¢s at your own expense payable on the last day. All prices are in USD. Prices for drinks on board are standard like in hotels. The morning after (last day on board) at about 8:00am, we went ashore on an island and explored a cave for about an hour. We were served an early lunch at 11.30am and reached the jetty by about 12 Noon and disembarked by 12:15pm. Our journey back to Hanoi was without incident and we arrived at our hotel by 4.15pm. Overall it was a great trip. Along the way, we made great friends with a nice family of 5, met the warm and friendly people of Vietnam, savored the sights, smells and sounds of Hanoi and ate things that we were daring enough to eat. We are already planning our next trip back to Hanoi and Halong Bay and it¢ll probably be sometime in the fourth quarter of this year.